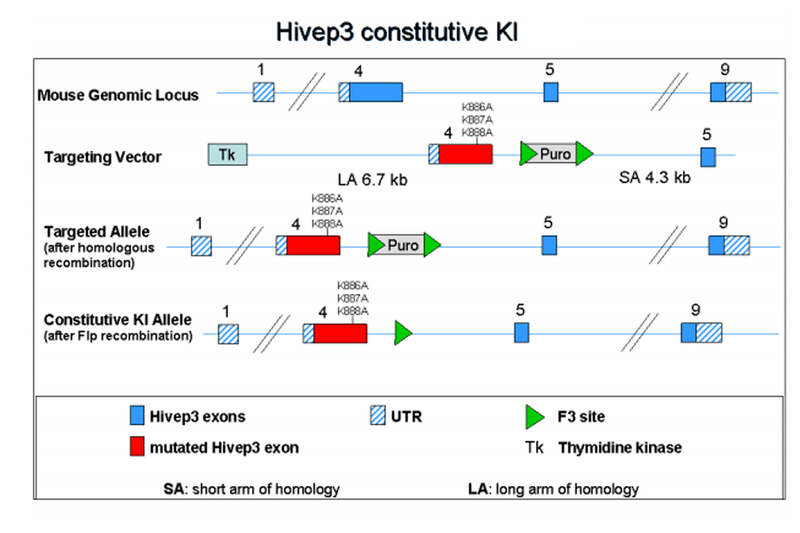 Hivep3 exon 4 contains the translation initiation site. K886A, K887A and K888A mutations have been introduced into exon 4 (aminoacid: KLPPKKKRLR to KLPPAAARLR; base: AAGAAAAAG to GCCGCTGCC). The positive selection marker (Puromycin resistance) has been flanked by F3 sites and has been inserted within intron 4. The remaining FRT recombination site will be located in a non-conserved region of the genome. Datamining and Design performed in 2010.